Kala Jamun for A Happy Diwali!!! Iss diwali pe hamari dua hai ki, Apka har sapnna pura ho, Duniya ke unche mukam apke ho, Shoharat ki bulandiyon par naam apka ho! Deepawali ki dher saari shubh kamanayen! On this Diwali we wish, May every dream of yours come true, Hope you achieve success in all endeavours, Hope your name shines on the pinnacle of fame and success. Wishing you a Happy Diwali! As a kid or an adult, I have always loved the sight that Diwali brings to my eyes. It’s cheerful and welcoming, bright and seasonal in all vivid colors boasting the festivity. And beyond everything it makes time for us to remember our family and friends; take a while out of our busy schedules to unite with our pals, wish them and celebrate as one. October-November is the blissful of all months as they are packed with festivities, feat and buzz. True, it’s not even weeks since Dusherra got over and we’ve already begun waking up to sounds of crackers; that reminds me Diwali is here. The makeshift tents that sold clay dolls of Gowri and Ganesha have now replaced themselves with mounds of clay diyas in all varieties. As I cross the market in my vicinity on my walk back home, the usual scenes of the day have changed to being busier and more crowded than any other day of the year. Street vendors have made their presence felt, occupying their spaces on either sides of the pavement, frisking their business with piles of Diwali goodies; diyas in all sizes and shapes, variety of colourful kandeels hanging high in the air, heaps of flowers making their way out of the wicker basket, neatly stacked mounds of rangolis in bright, bold colours being scraped out to be wrapped in newspaper pouches; make shift tents selling crackers of all kinds, with the crowd hovering over them in lure of obsessive shopping and celebrations. It’s a sight I love to watch, cheerful and happy people all around, carrying huge smiles as they walk back, their hands full, weighed down by the bulk of items they've shopped for the season. Almost every shop in the town is decorated with rice bulbs, tinsels and festoons, very glamorous and festive, calling out for attention, and their massive discounts are inviting enough to loot your money on all that’s on sale. It’s seriously tempting and I have been a part of that bargain, doing away with my old clothes and revamping my wardrobe with new clothes, sandals and accessories! We’ll wake up to the dawn of Deepawali tomorrow morning. Since a week, I have been busy mopping our home clean, the cobwebs dusted, the kandeel has been put up to light the evening, oil lamps have been washed and the kitchen has been a busy bee. We’ll have the ritualistic oil bath tomorrow before sunrise, followed by donning new clothes and then the pooja, trailed by busy activities in kitchen for an elaborate feast. Our families will come together in the evening when sweetmeats will be out, the diyas will glow, the rice bulbs will sparkle, the kandeels will light our balconies, swaying high in the air, the sound of crackers will fill the atmosphere, and neighbours and friends will pitch by to pour in wishes. With all this I realized that my post for Diwali is not published yet! Panic attacks me. Wasn't I prepared yet??? I pause, scan my drafts, but don’t find any that fits the occasion for traditional sweets and savouries. But then, I know my kitchen has been busy this entire week because I had promised myself I will cook them all in my kitchen, this Diwali. The Khara boondi has been made and stored in steel dabbas and they’ll be brought out tomorrow. The Kala Jamuns I prepared yesterday are soaking in their saffron syrup, absorbing all the succulent juices and they shall be ready to be served to all who’ll visit us. We’ll have some more sweets and savouries coming out of our kitchen, so I am pressed on time, which is little at hand, and have nudged myself to steal some time out to photograph a couple of decadent jamuns and post them here so that all of you can enjoy as much as we will. Kala Jamun, as the name signifies is black in color, a color that comes from caramelization of sugar or re-frying of the jamuns. I’ve been an ardent lover of Gulab jamuns, but stayed much away from Kala jamuns till a couple of years ago when I first tasted them at Hotel Majorda in Goa. I mean how appealing can a sweet that’s black in color be to our eyes? I believe I was a convert because of the presentation. The silver wark topping the jamuns, lusciously absorbed in saffron syrup and pistachios dotting them did all the justice to these little treats as much as they deserved. In my attempt to make these kala jamuns from basis, I've used skimmed milk powder instead of Khoya (milk solids), an easier option and equally delicious. The nonfat milk powder we get in India is sweetened, hence frying the jamuns will inevitably lead to darker coloured jamuns than the store bought mixes, hence making kala jamuns is a breeze. Hope you’ll love them and will not fail to leave a lasting impression on your taste buds. In a large pan, add water, sugar and saffron strands and bring it to a rolling boil. Let the syrup boil for a minute then remove it from the heat. Ensure the sugar is dissolved. Add the ground cardamom seeds. Set the syrup aside. In a bowl, mix milk powder, flour and baking soda. Add the butter and mix well. Now add milk to make soft, sticky dough. Allow the dough sit for a few minutes. Milk powder will absorb the extra milk. If the dough is dry, add more milk, as the dough should be soft. Knead the dough lightly. Divide the dough into about 20 equal portions and roll them into round balls. 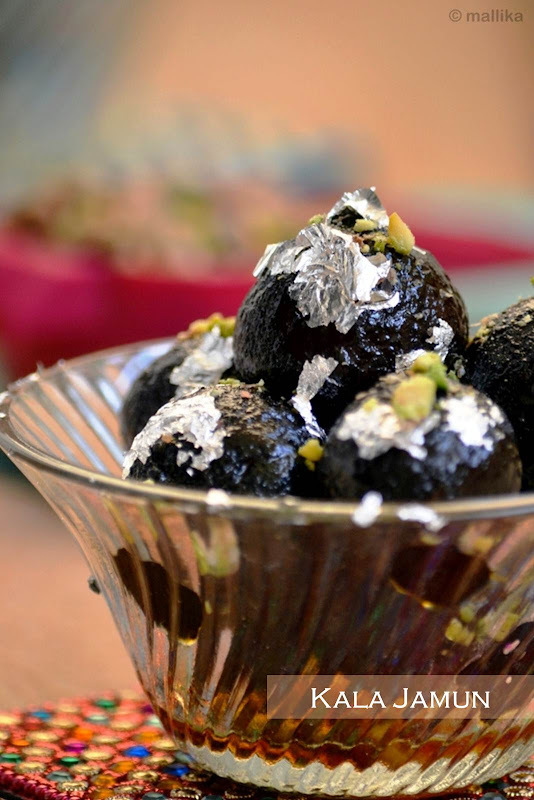 Stick a pistachio in the center of each jamun and roll well to round balls. Heat the oil in a frying pan on medium heat. Fry the jamuns till they turn brown. Continue frying till they turn darker in shade. Transfer the fried jamuns to the hot sugar syrup. Allow them to soak in the syrup for at least 30 minutes prior to serving. Top each jamun with silver wark and sliced almonds and pistachio and serve warm or at room temperature. Like every year, this year too we shall look forward to the dawn of Diwali to celebrate the festival of lights in full life and spirits. Wishing you all a Happy, safe Diwali and a Prosperous New Year! Absolutely no festival is as heart-warming as the festival of lights! Happy Diwali to you too Mallika! I see it can be quite as task to be a mother of a toddler, work and still manage to dish up these Diwlai goodies as well. Love your silver draped kala-jamuns! Your kala jamuns look super-delicious and gorgeous! Loved the last click... it looks so irresistible!!! Happy Diwali to you and your family! I'm planning on making gulab jamuns tomorrow. I hope they turn out at least half as good as yours. Belated HaPpY DiWaLi admin...it looks so delicious...keep going..
Belated diwali wishes to you and your family. Incredible beauties, wat a eye catching kala jamuns.wish i get few now.